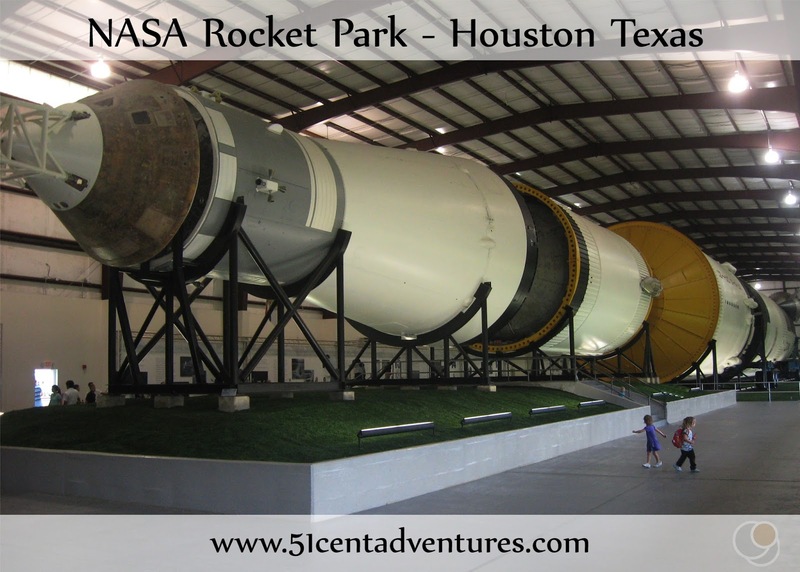 Description: Rocket Park is a stop on the Johnson Space Center Tour in Houston, Texas, but it is also available to the public for free. The park contains a Mercury-Redstone rocket, the Little Joe II rocket, as well as some other large equipment from the 1960's space program. 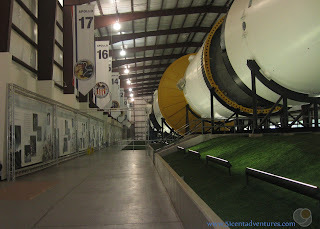 The most amazing thing on display is an actual Saturn V Rocket which is housed inside a giant climate controlled building. Location: 1601 NASA Road 1 Houston, Texas. This is down the road from the main entrance where you take the tour of the space center. Cost: Rocket Park, including the Saturn V rocket, is Free. However, if you wish to see any other part of NASA, such as Historic Mission Control, then you will have to pay for a tour. 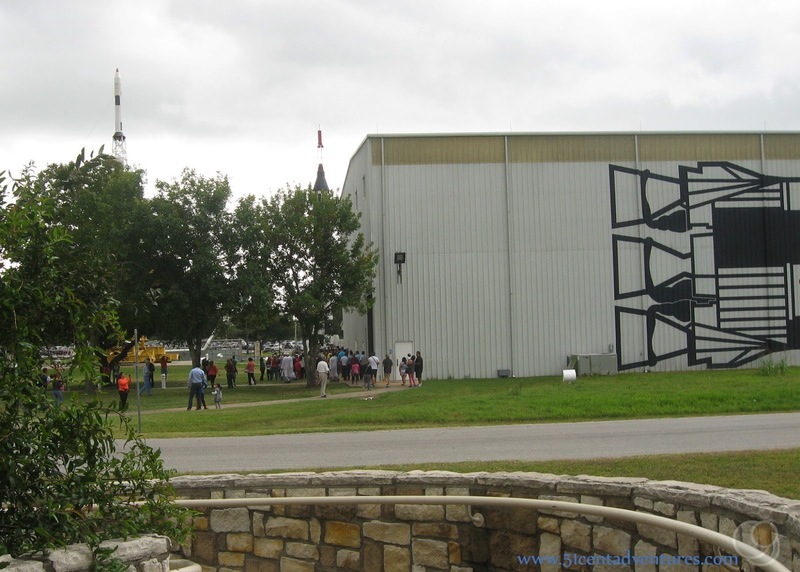 Operating Seasons and Hours: The Johnson Space Center Hours are 10:00 am to 5:00 pm Monday through Friday, and 10:00 am to 6:00 pm Saturday and Sunday. 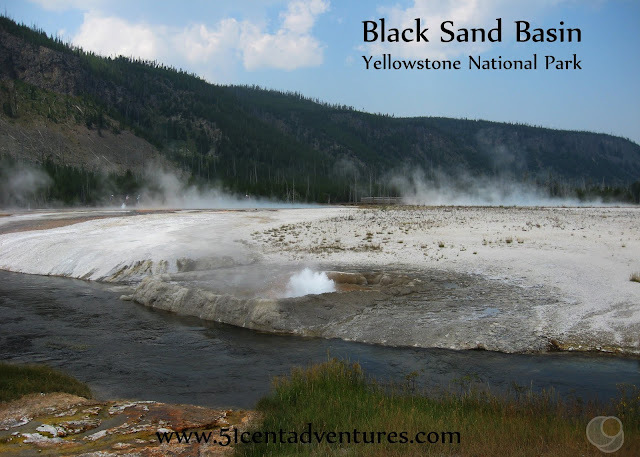 This was the second stop on the fifth day of the Texas Coastline Road Trip that my husband and I took our kids on in November of 2014. We finished up at the Nature Center in Brazos Bend State Park and headed east toward the NASA area southeast of Houston, Texas. I've always been interested in the US Space Program. In seventh or eighth grade I did a research project on the space race. As an adult I read one of my all time favorite books on the subject by NASA's first Flight Director Christopher Columbus Craft. His book is called Flight, and it's his memoirs of the early days of NASA. He was with the program back when they didn't even have the word astronaut. I've always been impressed by the great things the program was able to accomplish. 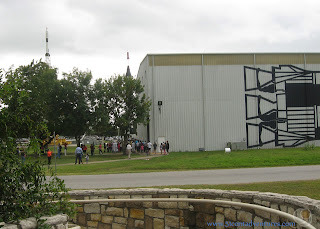 When my family moved to Texas, a visit to NASA was always on my list of things I wanted to do. But my husband and I didn't want to pay the price for a tour. An adult ticket is around $20 and a ticket for children ages 4-11 is around $15. We just couldn't justify paying that type of money for something that we weren't sure our kids would appreciate. 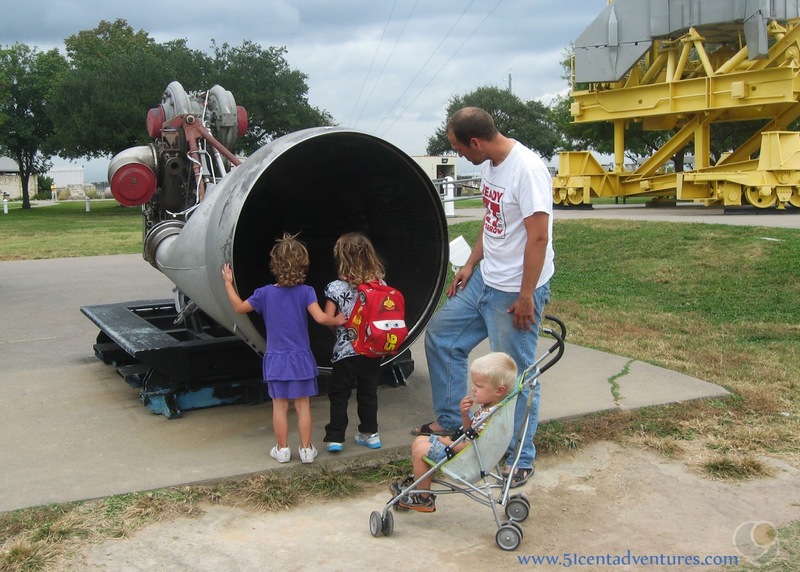 We'd been waiting for one of our children to get really interested in rockets before visiting NASA. Every once in a while I'd show the kids the movie Apollo 13 to see if they got excited by the rockets, but no one had shown much interest. About a year and a half after we moved to Texas my sister found out that Rocket Park is free. This is part of the NASA tour, but it's also open to the public. 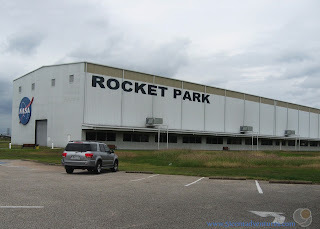 Immediately a trip to Rocket Park made its way to the top of my list of things I wanted to do during our Texas Coastline Road trip. My sister gave me directions to the park. I've included them in the "directions" section of this post She also added that we'd feel like we were lost and going the wrong way. That was true because we had to pull up to a gate and tell a guard that we were trying to get to Rocket Park. But we were in the right place because he waved us right through and showed us where to turn to reach the correct parking lot. Just as it's name suggests there were real rockets on display in Rocket Park. 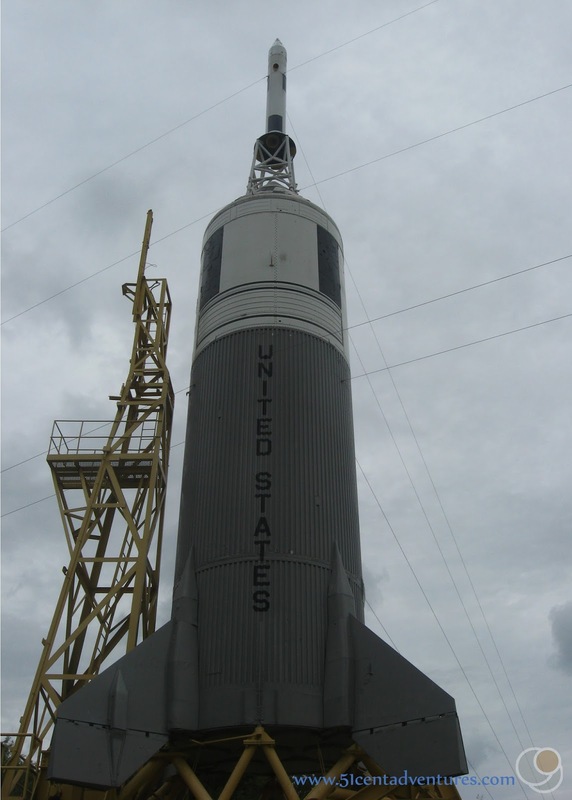 There was a Mercury-Redstone Rocket from the early days of NASA's attempts to put men into space. There was also a rocket named Little Joe II. 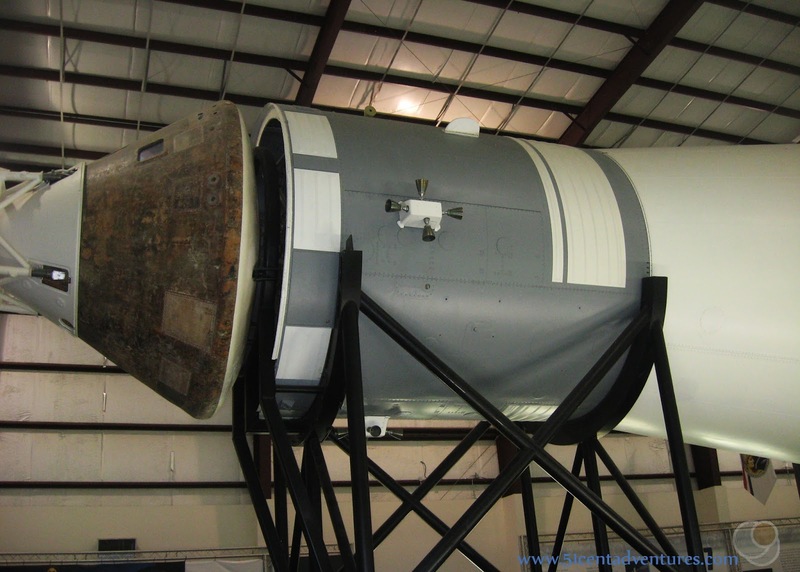 This rocket was used to test the abort systems for the Apollo Space Program. I was surprised by how small the Mercury Redstone rocket really was. I read a comment once that said that the Mercury Program Astronauts "wore" rockets rather than climbed into them. I could certainly see how that was pretty much true. 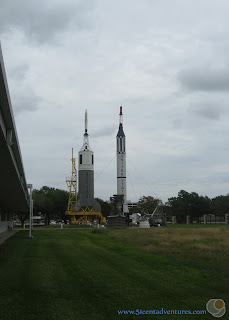 At the time of our visit, I assumed that the other rocket on display was a Titan II rocket from the Gemini Program. However, it is really a rocket known as Little Joe II. 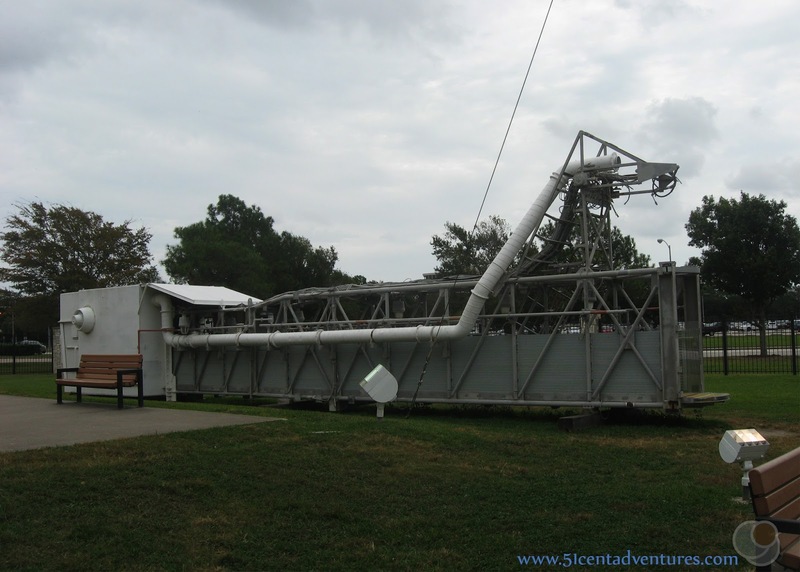 This was used to test the abort systems for equipment that would be put onto the Saturn V Rocket during the Apollo Program. There were other things on display such as engines. I liked seeing this fuel pump arm. My kids enjoyed running around and would spend a few seconds looking at each object. 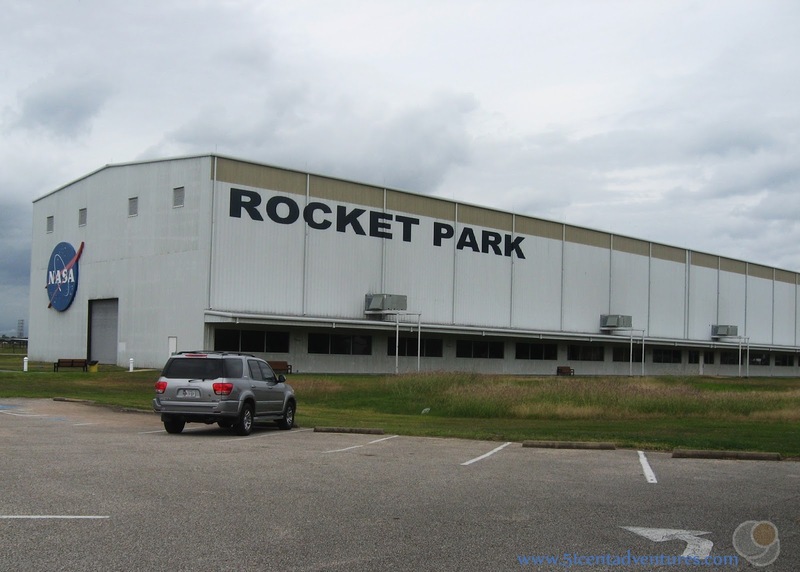 The best part of Rocket Park is what's inside the building. I knew what was in there, but somehow I forgot until it was almost time to go inside. 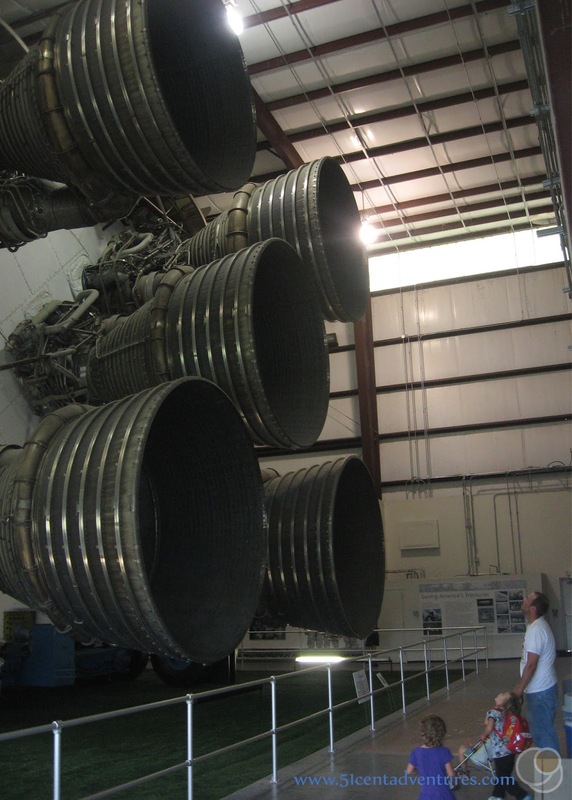 So I was kind of shocked that THERE WAS A SATURN V ROCKET IN THERE! There really isn't anyway to show you how big this thing truly is. You really have to stand next to it to get an idea. I read that the rocket would be over 33 stories tall if it was standing up. I feel like I need give you a chance to understand the importance of this rocket. 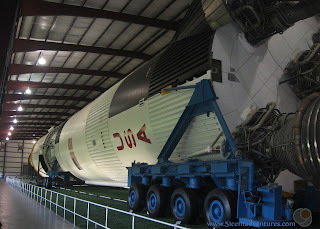 The Saturn V rocket is the rocket used during the Apollo Program. 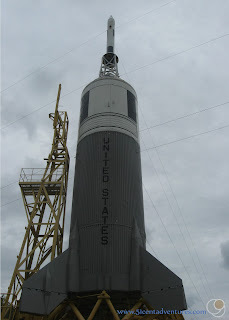 The is the rocket with enough power and equipment to get men to the moon. It's amazing. Really the best way to appreciate what this rocket could do, is to watch this clip from the movie Apollo 13. Of course all the footage in this clip is from special effects, but it does a great job of helping you feel like you are watching a real rocket launch. We were all impressed by the size of the engines. As we walked passed the rocket I realized that my jaw was literally hanging open. I was in awe of that rocket. What's really amazing is that most of the rocket was used just to get the top three segments into space. And of everything on the rocket, only the command module came back to earth. 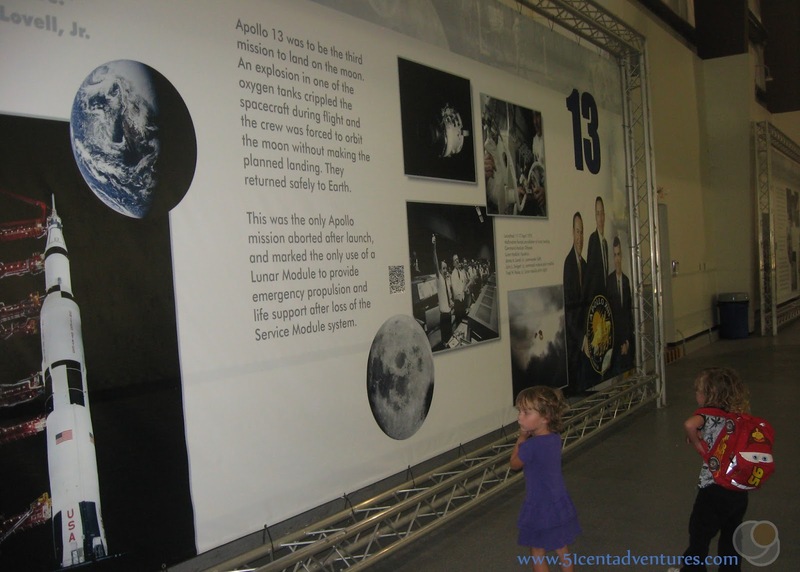 On one side of the building there were displays explaining each of the Apollo Missions. My kids were most interested in the display for Apollo 13. They remembered that movie from my most recent attempt to get them interested in rockets. We went out another door and walked over to a little pavilion that was part of the park. 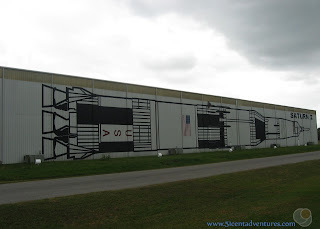 The north side of the building had a life size drawing of the Saturn V rocket painted on it. An official NASA tour arrived while we were at the pavilion. They came in on a tram and all got off in a large group. I'm sure they were having a good time, but I was glad that we had been able to explore Rocket Park without being part of a crowd. I still want to go on a full tour of NASA one day. But I'm fine waiting to do that until my children can appreciate it. In the meantime I'm so glad that Rocket Park is free. It was great to see some amazing parts of American history. Recommendation: If you are going to be in the Houston area, and are even remotely interested in rockets or American history, then you should definitely plan to visit NASA's Rocket Park at the Johnson Space Center. The fact that you can see a Saturn V Rocket for free makes this one of the best things to do in Houston. "Rocket Park when coming off of I-45: Take the NASA bypass exit or NASA Road 1 (Sometimes it's called NASA Parkway). It's a series of two roads that come together as one. Drive in that for a bit and then turn left onto Saturn Lane. Take a quick right into the NASA gate. The is a guard station there. Tell them you are going to Rocket Park and they will wave you through to the left. Park and enjoy. Don't get on any trams." Here are some additional notes for how to find Rocket Park. 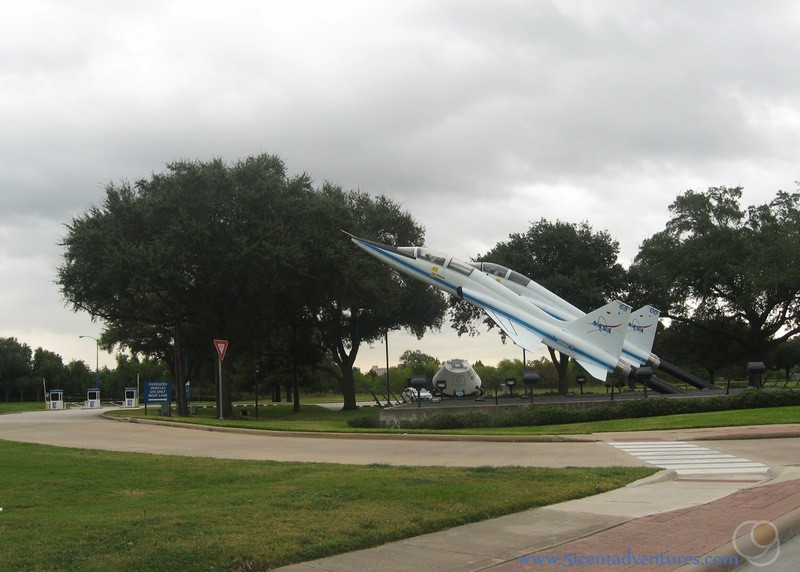 The park is about a block east of the main tourist entrance to the space center. This is what the main entrance looks like. DO NOT TURN HERE. Instead keep going east. Turn left onto Saturn Lane and then take the first right. This is where the guard station is. There are lots of signs that say something like "employee parking only" and other things like that. You will feel like you are in the completely wrong place. But tell the guard that you are going to Rocket Park. He'll let you in and tell you to turn left into the Rocket Park parking lot. After that you'll know you are in the right place. 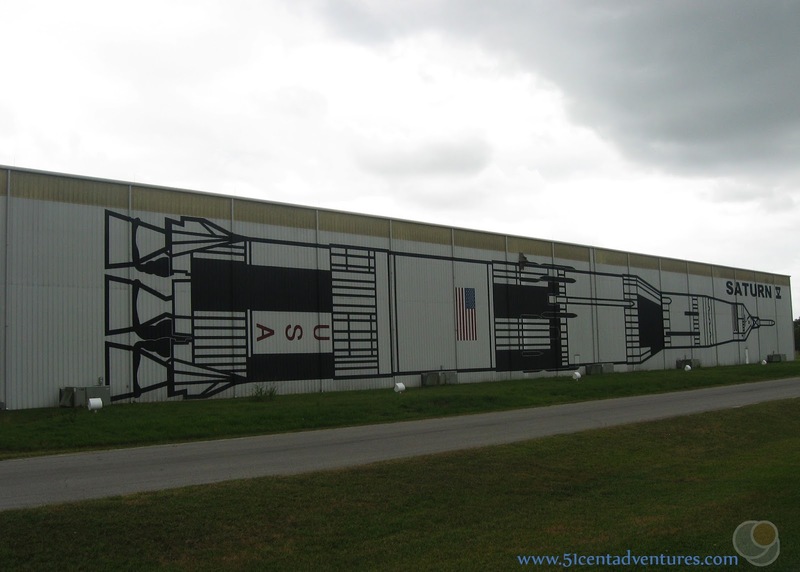 Additional Information: There was an unexpected sight on the north side of the Saturn V building - there was a cattle ranch back there. Back in the 1990's the director of the space center saw photos from the 1960's that showed what the land looked like before the space center was built. 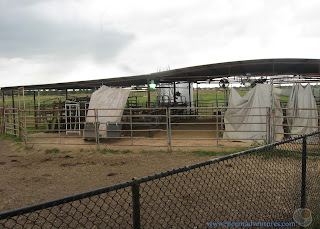 The pictures showed Texas Longhorns grazing. He decided to bring back a little bit of that ranch history, and partnered with the local school district to create a program to teach students about cattle. 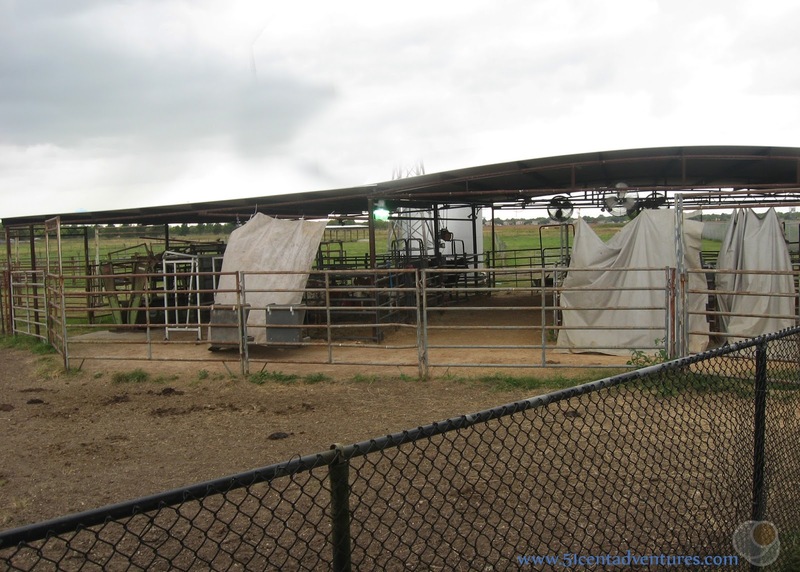 The Texas Longhorn Breeders Association of America and the Houston Livestock Show and Rodeo got involved too and the program has grown. Places Nearby: There are plenty of things to do in Houston. I talk about several of them in other posts. One thing I just discovered is that the many of the museums in Houston's Museum district have free admission times and dates. If I'd known about that I probably would have planned to visit at least one museum during our road trip. 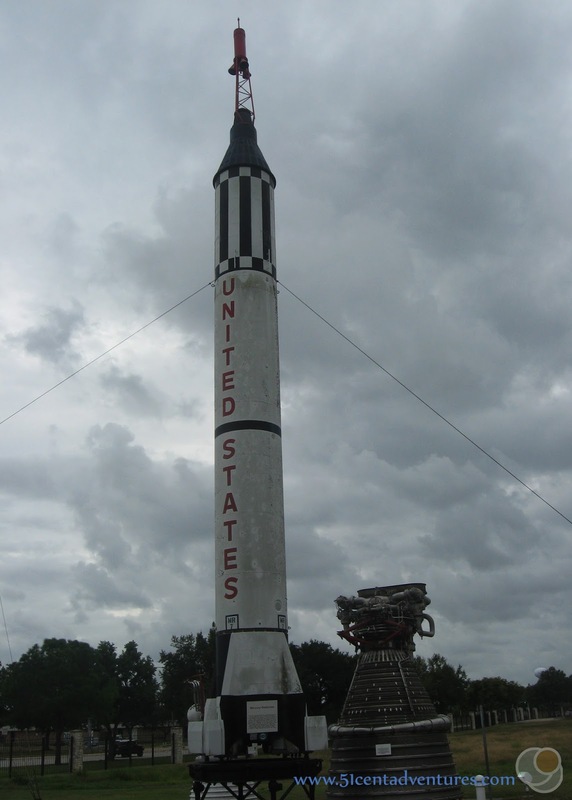 Valerie, since the main part of the rocket falls into the water is the main part of the rocket in Houston a replica? The part where the astronauts sat looks burned like it is the real part that re-entered earth. We really enjoyed this museum too, especially your dad. Good question. I'm pretty certain that this rocket was scheduled to be used for one of the cancelled Apollo missions. The program was scheduled to have at least 3 more missions after Apollo 17, but funding was cut before those missions went to the moon. So it is an actual Saturn 5 Rocket, but it wasn't sent into space so that's why it's on display. Yes, this is the complete Apollo 18 rocket, top to bottom. It was built and ready to go, but as you mentioned the project was cancelled with Apollo 17.